POWER THEORY was envisioned and created in 2007 by Bob “BB” Ballinger with the intention to form a True Metal band with a mix of the NWOBHM, 80’s German Power Metal, and a little bay area Thrash thrown in to shake it up. 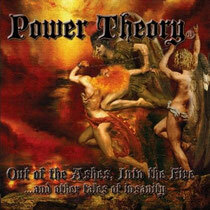 The strength behind POWER THEORY is a penchant for creating heavy songs with dynamic range and lyrical deepness. Dave Santini (Vocals) and Bob "BB" Ballinger (Guitars) have become like long lost brothers who've reunited, and found a missing extension of each other with a DÉJÀ VU like ability to write music together. The addition of Jay "The Bezerker" Pekala on bass completes a solid back line. His straight forward, no holds barred, melodic "Viking Style" playing makes the new metal bass lines the best they can be. Also the addition of drummer Lorin Savadove (a veteran of the metal scene) has taken the band to the next level. With this line-up, the band recorded the demo “Metal Forever”, and in 2010 they have signed a deal with PURE STEEL RECORDS (GERMANY) for the official release of their debut album “Out of the Ashes, Into the Fire”. And it has charted in at #21 on the International Disk Import Chart as ranked in the November 2011 issue of the Japanese Magazine BURRN. This album is now available at amazon.com. Currently they are working on their next CD "An Axe TO Grind" and the cover artwork is already done.